To be a Fresenius Travel Nurse, you’ll need a minimum of 2000 hours of clinical dialysis experience within the past two years. All Travel Nurses will receive 1-2 weeks of orientation and onboarding upon hire to help you acclimate to being part of the Fresenius Medical Care team. Each assignment term is 13 weeks, and upon completion you’ll have the opportunity to either transition to a new city or extend your current assignment. Fresenius Medical Care offers outstanding compensation, including the highest pay for travel dialysis professionals. You’ll also earn up to four weeks of paid time-off. Benefits include free private housing or housing stipend, meals and incidentals allowance, and a comprehensive benefits package for medical and dental insurance. 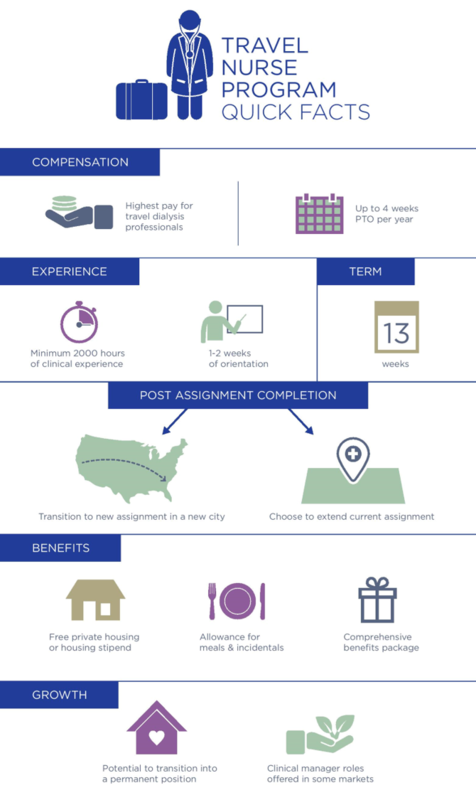 Some areas even offer a monetary bonus upon assignment completion! As you continue your Travel Nursing career at Fresenius Medical Care, growth opportunities abound. Lead Travel Nurse or Clinical Manager roles are offered in some markets, and you may also have the potential to transition into a permanent position with Fresenius. Are you ready to explore the United States? Check out our available travel nursing opportunities below. Wondering where some of our travel nurses are now? Find out!